Interested in advertising that only costs you money when it brings a result? In the past, you may have bought ad space in a local newspaper or industry magazine. Perhaps you even advertised on radio or local television. In all those instances, your ad price was set by the media outlet and you had almost no way of knowing how well it worked. You crossed your fingers and hoped the revenue numbers ticked up past the hundreds or thousands of dollars you invested in the ad. Many times you had to wait weeks or months for it to even be circulated, so your sales and promotion activities had to be mapped out months in advance. With Pay-Per-Click Advertising (often called PPC), your ad is shown to people in your target market, and you only pay for the number of people who actually click on it. You set the parameters for who sees the ad (your perfect kind of customer), and then you make an offer that prospect is likely to be interested in. If you succeed in attracting your prospect’s attention, they click your ad for more information, and only then do you get billed. You don’t pay for those who don’t notice your ad. You don’t pay for those who see it but aren’t interested. You only pay for those already inclined to act on your offer! If you’ve been advertising the old-fashioned way before now, you understand what a big leap forward this is for reaching your ideal client and making the most of your advertising budget. For more budget-friendly, lead-generating ideas like this, be sure to get our free Digital Marketing Strategy Guide right now. 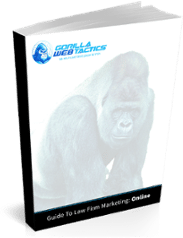 Inside, you’ll discover what a long-tail keyword is and how it can help you reach motivated buyers for just pennies per click—plus seven more hyper-specific secrets to online marketing in the simple, no-nonsense language you’ve come to expect from Gorilla Webtactics.